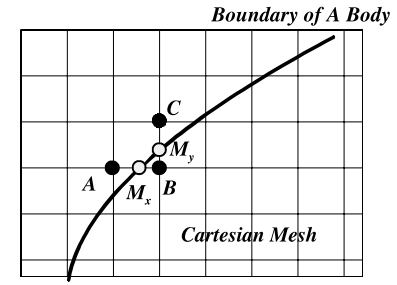 Finding boundary intersection points with Cartesian grid? I would like to find the intersection points e.g. $M_x$ and $M_y$ as in the attached figure. The boundary (solid line) is defined by the Lagrangian points. I am working in C++ (basic - medium proficiency). In this regard, I need a computer algorithm or code to get the intersection points both in x- and y-in a separate arrays. Browse other questions tagged mesh-generation grid or ask your own question. How do you mesh and re-mesh a surface (2-manifold) in 4D?